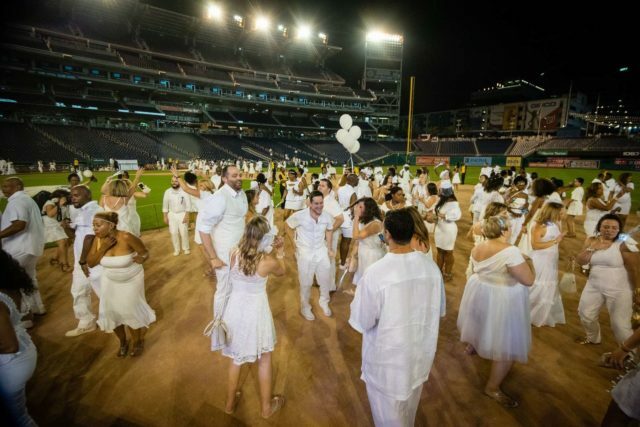 Dîner en Blanc is a pop-up white dinner party. The concept started 30 years ago and now takes place across six continents. Attendees bring their own food, tables, chairs, and meet at a secret location for an impromptu posh event of dinner and dancing in a beautiful location. 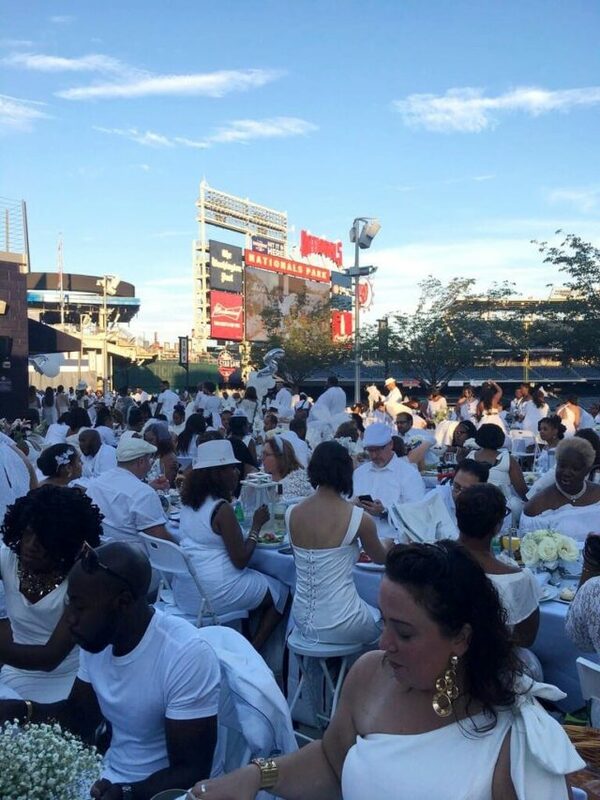 I think all attendees can agree that this year's Dîner en Blanc DC was not the best. The venue was a poor decision. The majority of the attendees were seated under the seats, fluorescent lighting and concession stands destroying the ambiance. 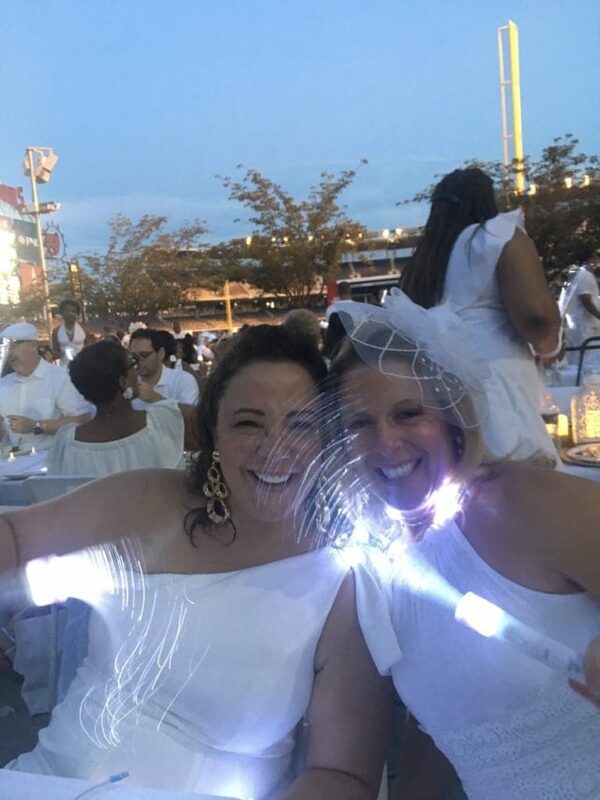 One of the magical parts of Dîner en Blanc is being part of the community but this venue separated us into clumps, unable to see the beauty of the rows of tables of other people from your city. This was not a chic, elegant, or picturesque setting. While the photo of me above may look pretty cool, do know while my sister saw that view I saw a wall about 10′ away with giant signs for tater tots and hot dogs accented by a row of overflowing trash cans. 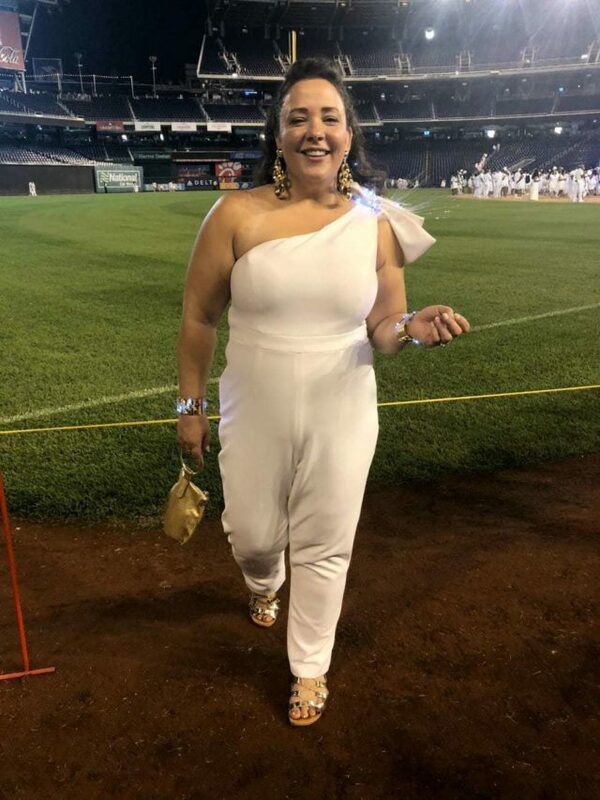 Reading comments on the DC Dîner en Blanc's Instagram I see that our lackluster experience was leaps and bounds better than that of the majority of the attendees. 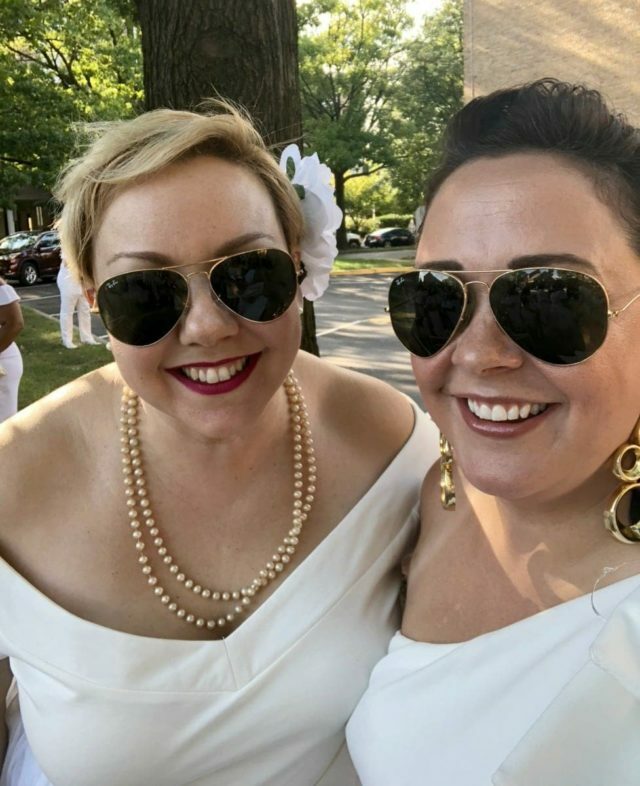 This was my second year attending Dîner en Blanc DC but I registered the year prior to that so I had access to Phase 1 tickets. My sister and I were going to sit in my friend Brea‘s group, but when I finally got into the site to buy my tickets I couldn't see her as an option (later found out for some reason she was temporarily locked). I was sitting in Penn Station waiting for my Amtrak train home on my laptop and texting with my sister and friend. We then chose to go in Diego‘s group; I didn't know any of Diego's available table leaders so I chose Jennifer just because. This was a random but smart decision. Jennifer was phenomenal, she managed us and all the issues with poise and professionalism and truly cared that we had as good a time as possible. We felt we were one of the last groups to enter Nationals Park but from reading on social media some didn't get in the stadium until 7:30 or later. But it seemed we were seated in the entrance area because the rest of the stadium was full. We were almost finished setting up when the official spinning of the napkins took place. Our section started clearing out after everyone ate so we decided to follow suit and go down to the field. Most of the stairs down were blocked, we found a line up on the concourse forming to go down the one set of open stairs and joined. A woman walking up the stars let us know they weren't allowing any drinks, even water down on the field so my friends held our place and I ran back to our table to leave our drinks. When I got back, we were at the front of the line and heading down the stairs. There was a line to get onto the diamond/dance floor. It looked like there may have been a second entrance behind the stage so we decided to walk along the perimeter in the dirt to the other side. Yeah, white jumpsuit, open-work sandals, and dirt don't mix. We stop to get photos with The Presidents; they had Nationals staff there just to hold our phones and snap a few shots. We got to the other side… no entrance to the dance floor. I text my friend who didn't sit with us to ask where she is. She says they won't let her down to the field, they've shut down all the stairs. We walk back to the only entrance to the dance floor; there's another line. We get in line. After a few minutes, they let us onto the dance floor. It's not packed, and we easily move up to the stage where the DJ is. The dance floor was the baseball diamond (AKA more dirt) and it was extremely well lit (like a baseball game at night) but the vibe of the people dancing was awesome and we had a blast. Around 9:30 the dance floor starts thinning out big time to the point that we decide to leave as well. We get back to our section and it's about 1/3 already packed up and people are leaving in droves. We decide to pack up and were hopping into our Uber around 10pm. Not the chic event I expected. However, my three friends and I had a blast. We came into this year treating it less like a posh dinner and more like a music festival. 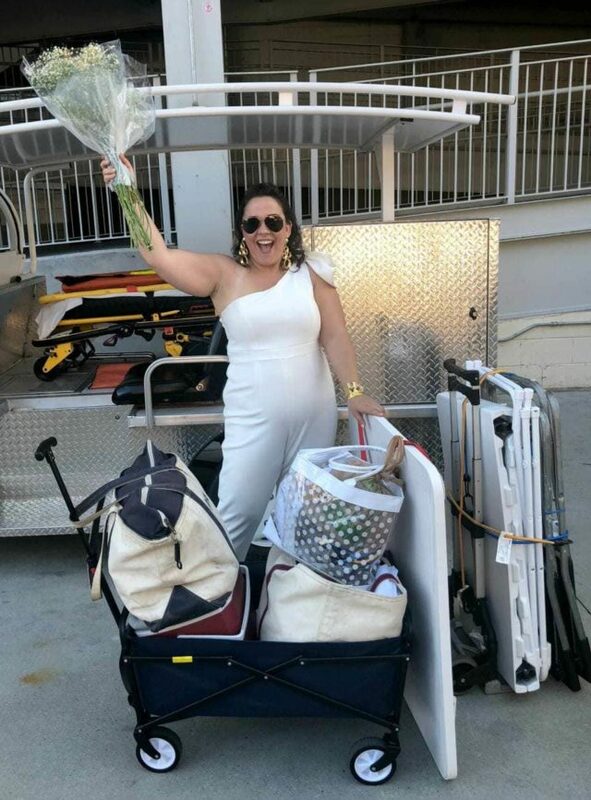 My sister and I have been to several fests and treated packing and planning of Dîner en Blanc like a mini Bonnaroo but with fancier clothes. The four of us had mile-long email and text conversations discussing food, supplies, and outfits. The night prior we met for dinner and had a “dress rehearsal” of the setup of our tables and the packing of our supplies to be able to cart up to a mile by foot. The planning and strategy paid off with a quick setup and cleanup, easy transportation, a beautiful table, and a delicious meal (stay tuned I'm working on a Dîner en Blanc tips post). We only knew each other in our table group, but we met many awesome new people and saw some of the most amazing outfits and tablescapes. 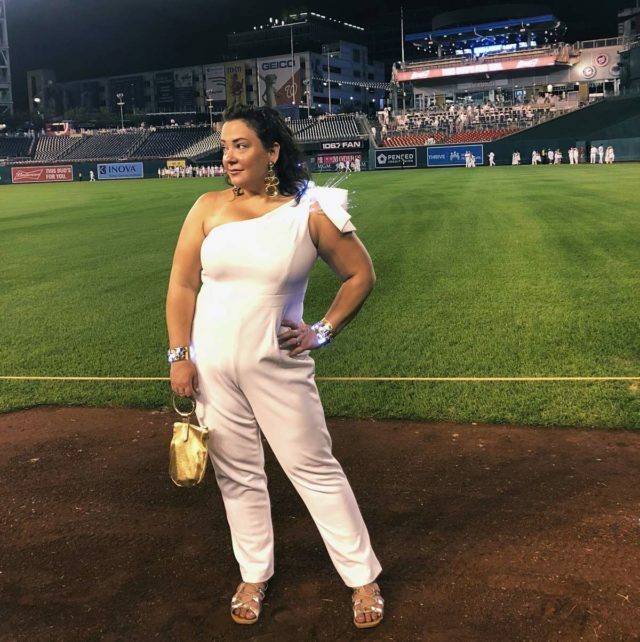 The jumpsuit is Adrianna Papell and those who read my Amazon Prime Wardrobe review post already knew I was going to wear it. It wasn't a petite fit, so I took it to my tailor who removed the shoulder bow to shorten the strap/top underneath, and then did a little nipping and tucking on the sides. To make the look more fun for once the sun set, I took a strand of fairy lights and wrapped it around the shoulder bow and made some bow-shaped twists so it would light up. 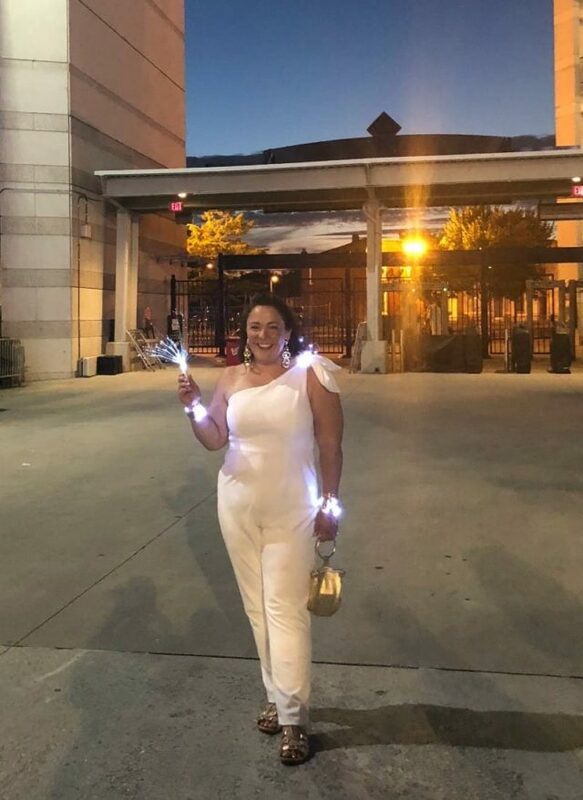 They provided us with battery operated “sparklers” since flames weren't allowed in Nationals Park; after shaking it at dusk with other guests, I tucked it into the shoulder of my jumpsuit for a bit more sparkle. For accessories, I wore two of the Secret Garden Cuffs from cabi, one on each wrist. At dusk, I wrapped each of them with fairy lights. The earrings are vintage from Etsy and you've seen them before on the blog in this post and this post. Again this year I took my gold leather ring handle bag to carry my phone and essentials (this is what I wore last year). With the ring handle it's easy to slip on my wrist and still be able to dance. My shoes were my gold flat sandals from Bella Vita. Nothing spectacular, but good for having to walk to the venue and dancing on dirt. Beauty wise, I planned to wear my hair all full crazy curls but my hair decided to protest that and go full-on middle aged Kip Winger. So I sprayed the front for some volume (recently received this hairspray from Saints & Sinners and it's fab and free of all the gross things in many beauty products) and pinned up a bit. 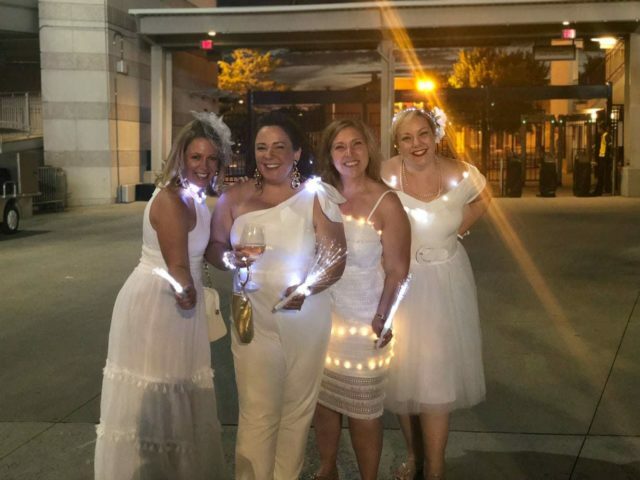 Photo via Diner en Blanc Facebook Page, I'm over on the far right. I found another photo of me dancing at Dîner en Blanc in this Washingtonian article, very last photo again on the far right. This proved a smart hairstyle as it was hot and I danced my booty off leaving all my hair sopping wet. For makeup, I used Cicapair as a primer under my Supergoop CC Cream and used Urban Decay's All Nighter Mist to hold it. I had a TON of shimmer, various creams and shadows and sparkly bronzers I had in my arsenal. I even added shimmer to my Nuxe oil and rubbed it on my collarbone, shoulders, and arms. If you'd like to see more from my night at Dîner en Blanc, I have saved the night as a “Highlights” circle on my Instagram bio page! What about folks who don’t want to drink. Do you have to purchase the event wine? You all looked so fun and fabulous! We have a similar event in my area, but it is WAAAAAY smaller and doesn’t receive anywhere close to this kind of attention. I love yours (although I can appreciate that the venue was not really a good fit for this kind of event). We have luminata festival coming up in September and now I have to hunt down those battery-operated sparklers! Wow, what an amazing venue! You are so lucky to have been able to have access like that to Nat’s Park, which is one of the pre-eminent MLB ballparks in the country! My brother works for the Nats and I can tell you first hand the amount of hard work that goes into providing a first class baseball experience for fans PLUS being able to cater to private events such as the one you attended. I saw the flood of stories and posts of this event that night on social media. I had never heard of it before and really want to try and go next year. Thanks for giving some insight about the event. Hopefully next year can be better and I can attend! This is an excellent post! I was definitely one of the groups who didn’t get in till around 715-730 and we were only a few blocks away. It was a logistical nightmare and after hearing about how people were treated I’m just disgusted. But I do recognize others had a great time. I just wish my group and Jose around me in other groups experienced that too. I heard there were some bad situations that occurred on the field and that’s why they did not allow people down. Who knows? You looked beautiful though and i commend you for writing an honest piece.